The Alfa Laval Diabon® plate-and-frame heat exchangers are used for tough corrosive media. This range of heat exchangers combine Alfa Laval's know-how in heat transfer with Germany based SGL Carbon's expertise in graphite process equipment. 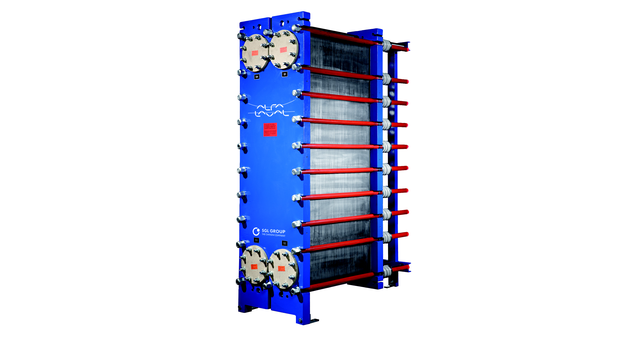 Alfa Laval Diabon® gasketed plate-and-frame heat exchanger combines high-efficiency heat transfer benefits with the exceptional corrosion resistance of graphite material. Alfa Laval and SGL Carbon, Germany, worked together to develop DIABON® plate heat exchangers. This collaborative effort combines Alfa Laval’s plate heat exchanger know-how with SGL Carbon’s expertise in graphite process equipment. The resulting product combines the high-efficiency heat transfer benefits of conventional plate heat exchangers with the exceptional corrosion resistance of graphite material. catalysts such as aluminium chloride. Alfa Laval DIABON® plate heat exchangers work on the same principle as conventional plate heat exchangers, except that the plates separating the media are made of special graphite materials. The graphite plates are available in three different material grades, DIABON® F100, NS1 or NS2. 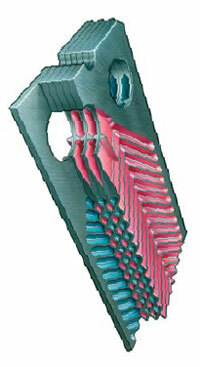 The channels formed when these graphite plates are assembled in a plate pack are sealed by PTFE gaskets. In addition, the tightening bolts on the frame are fitted with springs to compensate for thermal expansion of the plate pack, hence minimizing the risk of cracking the plates. Alfa Laval DIABON® plate heat exchangers are all supplied with a PTFE rope gasket. When the heat exchanger is assembled, this gasket rope is flattened to a very thin film approx. 0.2 mm). The thinness of the gasket means that the area in contact with the chemical is very limited, resulting in an extremely long service life. To date, the gasket has proved resistant to attack by all known chemicals, as well as resisting very high temperatures (>180°C).